1915 Dec 29. The Welsh Regiment. The undermentioned to be Second Lieutenants. John Gibson Abraham. 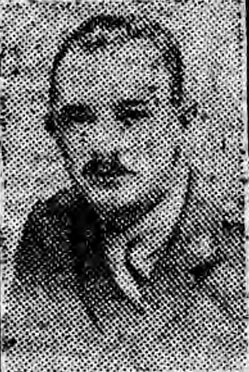 1916 Oct 20 Gazette. 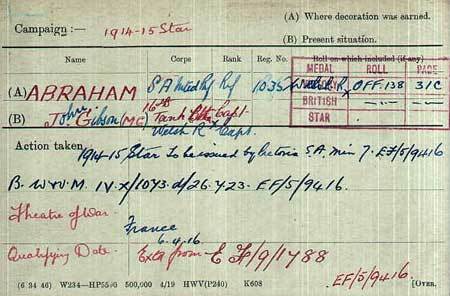 2nd Lt. John Gibson Abraham, Welsh R. For conspicuous gallantry during operations. He was coming back after guiding up a working party, when the enemy opened heavy shell and rifle fire. He at once returned, and, finding the officers severely wounded, took charge of the party. Finally he carried in two wounded men at great personal risk. 1917 Jul 1. The undermentioned 2nd Lts. to be Lts. , J. G. Abraham, M.C. 1918 Jan 28. The undermentioned Lts. to be Lts., retaining present seniority. Tank Corps. J. G. Abraham, M.C. (Welsh R., T.F.). 1918 Mar 2 Married. Herald of Wales and Monmouthshire Recorder SWANSEA M.C. WEDS. A wedding of considerable local interest was quietly solemnised at Church Church, Swansea, on Wednesday morning. The contracting parties were Lieut. J. Gibson Abraham, M.C., eldest son of Mrs. C. J. Abraham, 8, Walter-road, Swansea, and Miss "Betty" Jones, only surviving daughter of Mrs. Jones, Trafalgar Hotel, Swansea. The bride was charmingly at- tired in a purple travelling costume with a hat of mauve and grey to match, and wore skunk furs. The, bride was given away by her uncle ,Mr. Dd. Hopkin, and she was attended by Miss Hilda Evans, who wore a saxe blue frock with fur coat and black satin hat to match. Capt. Harold Williams was the best man, and the vicar (Canon the Rev. Watkin Jones) officiated. After the ceremony a reception was held at the home of the bride's mother. The honeymoon is being spent in Porthcawl and London. 1918 Sep 30. The undermentioned to be actg. Capts. while comdg. Sects. : — Lt. J. G. Abraham, M.C. (6th Bn., Welsh H., T.F.). 1920 Jun 10. 6th Bn., Welch Regt.—Lt. J. G. Abraham, M.C., is restored to the estbt. on ceasing to be empld. with the Tank Corps.